The Flex® DE Reflector is larger than most standard wing reflectors. Highly reflective aluminum offers excellent uniformity, output and diffusion. Patented enclosed end wing design for better control of the light footprint. Made specifically for double-ended (DE) horticultural lamps (not included). Features German made, UL listed double-ended sockets. Unique double-ended construction allows for maximum optical efficiency and uniformity. 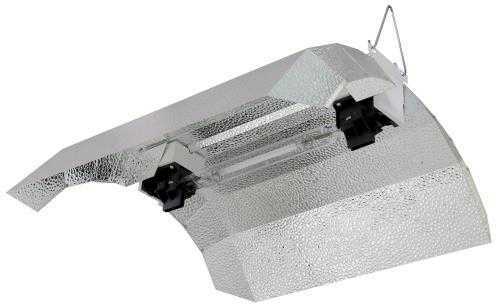 Improved spectrum DE lamps used in this fixture focus on the red component for increased photosynthetic response. They offer improved PAR values and increased PAR/lumen maintenance (up to 90% PAR at 10,000 hours of operation). Light weight and easy to hang. Comes completely assembled with prewired 15 ft lamp cord and sockets. US Patent: D770,081 and Chinese Patent: ZL2016300557068.